Speaker Saiki, President Kouchi, former governors, distinguished justices of the courts, representatives of our congressional delegation, members of the Hawai'i State legislature, elected officials, military leaders, honored guests, family and friends. As a new legislative session opens, I want you to know I am ready to work with you on the issues that affect us all. The State of our State is strong. We are a resilient people and the future is bright. As I stand before you today, I am struck by the beautiful and often challenging complexity that makes Hawai'i our home. We really are the most beautiful place on earth. We are of many cultures and faiths, and we live together in greater harmony than any place in the world. People from all over the planet come here to enjoy our environment, our host culture and their gifts to all of us: gifts of aloha, tolerance and respect, and the celebration of each other and our differences. We often need to be reminded of what makes us so special. We are one of the healthiest states in the nation. People here live longer than anywhere else in the country. We have the lowest unemployment rate in the nation. We are strong financially. Our bond rating is the highest it’s ever been in our history, making it possible for us to get the most bang for our buck when we borrow money. And we have made our voice clear: Hawai'i will not stand for the hateful and hurtful policies of the Trump White House. We are doing more than any other state to stand up for what is right – such as DACA and the Paris Climate Accord – and stop what is wrong, such as the travel ban and stopping transgender members of the military from defending our flag and our freedoms. So many of us are living paycheck to paycheck, relying heavily on our extended family to make ends meet. Owning a home, is out of reach for many families, with housing costs rising faster than wages. Too much of our time is spent in traffic, affecting our families and quality of life. The growing gap between those doing well and those who are not should concern all of us. We depend too heavily on imported food and fuel. We must find a just place in our relationship with our own history and with the people of the first nation of Hawai'i. And the challenges to our island environment, such as global climate change, stare us in the face every single day. I honor my predecessors, former governors, and I have built on what they have done. In doing so, I affirm three truths about Hawai'i and the way we govern. First, I see Hawai'i as a place and a people that cherish our children, celebrate our diversity, and want a better life for the next generation. Second, I see Hawai?i as a place and a people where we believe in ohana, respect our kupuna and understand that our 'aina and our ocean are critical to our quality of life. Finally, I see Hawai?i as a place and a people where we still believe in the promise of Hawai'i and the prospect of limitless opportunities. This is the legacy of our host culture, the cultures of our immigrant families, and all those who choose to call Hawai'i HOME. We have put these values and beliefs into action to chart the course to our future. It is one thing to say our children matter; it is quite another to do something about it. We have invested more widely in classrooms than in previous years. We promised to cool 1,000 of Hawai‘i’s hottest classrooms where soaring temperatures have hindered learning for years. I’m proud to report, that, with the Legislature’s support, we exceeded our original goal, and we're at 1,200 classrooms and counting. I also promised to empower our schools so they can focus on 21st century skills and critical learning. In meetings around the state, community members, teachers, staff and principals expressed frustration about top-down mandates and a one-size-fits-all approach to schools. Now, let's talk about housing. When we say 'ohana, we truly mean nobody gets left behind. For those who want to live in Hawai'i, probably no issue is more challenging than finding a decent, affordable place to live. And probably no issue challenges us as a society more than the daily sight of those who are now living on our streets and in our parks. We're on track to meet our goal of 10,000 new housing units by 2020, with at least 40 percent affordable. I'm requesting $100 million to maintain the momentum and produce more affordable homes across the state. It has been my firm belief that the state must remain committed to developing and delivering Hawaiian homelands to beneficiaries. In 2016, we provided $24 million in funding to the Department of Hawaiian Home Lands. This was the highest level of funding in the department’s 95-year history and more than double what had been set aside previously. A “special team” in public housing reduced the vacant unit turnaround time from 267 days to just 7 days. Even in the tragedy that is homelessness, there are significant signs that these policies are starting to work. Homelessness is down 9 percent statewide – the first decline in eight years. There's more to be done for sure. We continue our efforts to offer services to those who have so far refused to leave the streets. We also know how important community partners have been in tackling this challenge. Take Kahauiki Village, a permanent housing project for homeless families launched by local businessman and philanthropist Duane Kurisu. Duane brought together city, state, nonprofits and businesses to make the village a reality in record time. The first 30 families recently moved in. Duane, please stand and be recognized. 'Ohana also means that you should be able to put food on the table and be home with your family to eat it. That means jobs that pay well and commutes that work. That’s why I’m working to transform our economy to give residents a diversity of employment opportunities that pay higher wages and lead to a better quality of life. We’re tackling another quality of life issue, and that’s traffic congestion. From zipper, shoulder lanes and other contraflow lanes, to safety around our public schools and truck-only routes, we are going to where the problems are. We're reducing back-ups and bottlenecks – in West and Windward O'ahu, Kahului, Lahaina, Lihu'e, Hilo, Kona and other communities across the state. We must create a better life for the next generation – it is what we all want. We all dream of our children succeeding here in Hawai'i. With my three children on the mainland, I know firsthand how hard it is to have them an ocean away. My personal goal – the goal to which I have dedicated my service as governor— is creating a Hawai'i that gives all our children the CHOICE to live here. My grandparents came to Hawai'i in search of opportunities. It is not acceptable to me that many of our kids are essentially becoming immigrants in other places because we don’t have the opportunities here. We expanded campuses and offer more courses at UH West O'ahu and Palamanui. The creation of Hawai‘i’s Promise scholarships helps to pay for the costs of attending UH community colleges. The Entrepreneur’s Sandbox in Kaka‘ako brings start-ups together in one shared space and helps with loans and grants. We also founded the annual "hackathon" competition, which enlists hundreds of professional and amateur code writers to develop solutions for the state’s biggest information technology challenges. The University of Hawai'i is one of the leaders in this work, with the Manoa campus increasing its STEM graduates by more than a third in recent years and the community colleges tripling theirs. I am proud that together we were able to pass Kupuna Caregiver legislation that provides assistance for full-time family caregivers who also have full-time jobs. This is a win for Hawai'i's families. As our kupuna have taught us, paying our bills, honoring our obligations and saving for the future is how we build a brighter future. And we have done that. 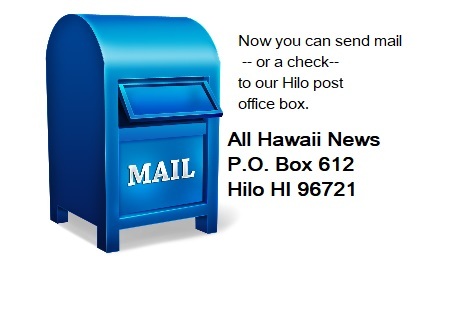 And we are working to modernize our tax collection system to make it easier and fairer for the people of Hawai'i. We're also making great strides in protecting our 'aina and ocean resources. To date, we have protected over 40,000 acres of watershed forests on Kaua'i, O'ahu, Moloka'i and Hawai'i islands. I also fought to give Native Hawaiians a seat at the table when it comes to the management of Papahanaumokuakea National Marine Monument. The Office of Hawaiian Affairs is now a cotrustee of the monument. Our goal of increasing local food production is another golden opportunity for Hawai'i. We are blessed with four growing seasons and a land-grant university with a College of Tropical Agriculture that has a long history of cutting-edge work. With all these factors, Hawai'i can and must become the premier center for new agricultural technologies. What we now need is the driver to make greater local food production possible. There is no better way than through our schools. I applaud the new leadership in the DOE’s Farm to School program, the leadership provided by Lt. Governor Shan Tsutsui, and the great cooperation of the Department of Agriculture and the State’s Procurement Office. Lt. Governor, please stand to be recognized. Working with the Legislature, I was the first governor to sign into law a bill requiring 100% of Hawai‘i’s electricity to come from renewable sources by 2045. Again, this demonstrates what we can accomplish when we work together. And this week we will join NRG Energy, Hawaiian Electric and Kamehameha Schools in celebrating three utility-scale solar projects on O?ahu. As a next step, we will grow a carbon market in Hawai?i. This way carbon polluters around the world can invest in restoring Hawai?i’s koa and ?ohi?a trees to offset their carbon emissions. We want the brainpower and the imagination of the world to continue to come here. They can help us find our way to 100 percent renewable energy sources for electricity, and in doing so, help the world find its way to 100 percent. Let us take the billions we export for fossil fuels, spend it here, and then export the energy systems we develop. Hawai'i has so much potential in this new globally connected world. We are already viewed as the ideal research base and testing ground for innovative, globally significant technologies such as telemedicine, smart cities, driverless vehicles and aquaculture. Hawai'i is a leader in solving the issues of our time. Much of what we do here in Hawai‘i is ground-breaking. Hawai'i is home to many talented individuals breaking new ground every day. 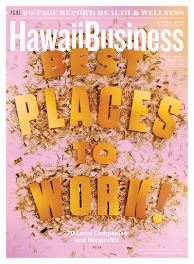 Hawai'i is full of stories of business innovators blazing the trail to create new products and services. The Big Island's Tina Fitch turned her start-up Switchfly into a global software platform used by almost every major travel and hospitality company. Now, she’s returned home and started a second company, HobNob. I’d like to recognize Tina, who flew in to be with us this morning. One example is a team of young millennials known as "The Three Amigos" – Jodie Nakamura, Ryan Mercado and Liam Tobin – the wait time for workers' comp hearings has been cut in half. This 2017 Team of the Year from the Department of Labor and Industrial Relations launched a project to digitize mountains of paperwork from some 20,000 claims a year. And there are many more dedicated workers just like them across the state. Jodie, Ryan and Liam – please stand to be recognized. 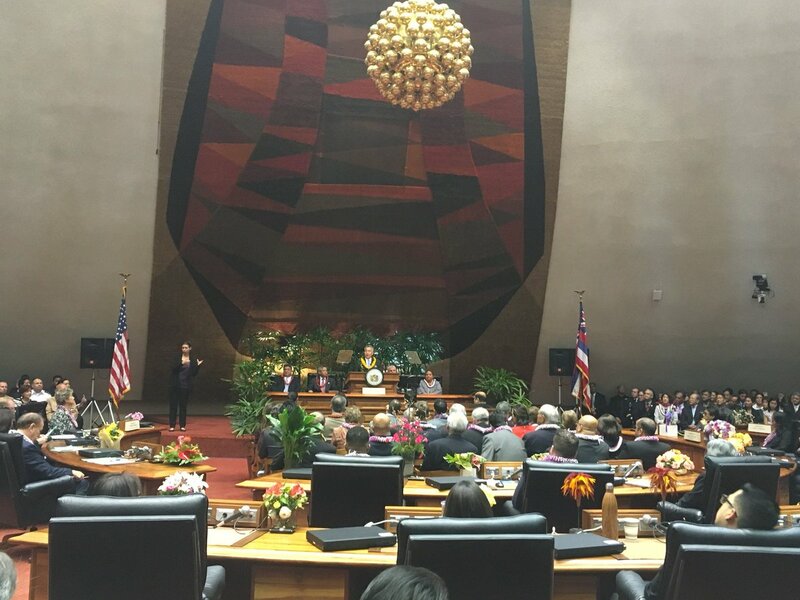 At the beginning of my speech, I said Hawai'i is a beautiful and complex place. I believe that is our gift to our children and to our future. Imagine a future economy for Hawai'i that isn’t reliant solely on tourism and the military. 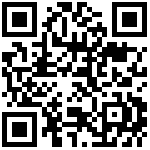 Imagine a future where local entrepreneurs are inventing useful products and services that are sold across the globe. Imagine that we use our temperate weather and four growing seasons to develop new hightech agricultural tools that increase yields for farmers from Hawai'i to India. And what does this mean for the people of Hawai'i? It means a healthier economy with quality jobs that enable us to improve our schools, take care of our kupuna and provide more affordable housing. This future Hawai'i isn’t as far off as it seems. We’ve already set things in motion. We’ve put stakes in the ground and we’re making progress. To face the challenges of the future, Hawai'i must seize opportunities, embrace change and identify the game-changing steps we need to take.